It was so much fun decorating the house this year. Just about every room was different in one way or another, so I was able to get creative and use old decor in new ways! I was trying to think if I had a favorite room this year, and gosh, I love them all for different reasons! Let’s get started in the kitchen! This is the first Christmas in our new kitchen. Typically I hang wreaths on the upper cabinet door fronts. Couldn’t do that this year! Rather than let the decorations take over, I kept it simple in here. I added small trees in buckets, and spread out my collection of plaid picnic ware and vintage thermoses. I originally planned to create and hang garland above the window. I decided not to, but only because I didn’t want to attach anything to my new tiles! I didn’t even want to hang command hooks! I’m sure I’ll be over it next year and I’ll load it up. From this angle you can see the mudroom entrance from the garage, the coffee station and the living room! Simple additions to the coffee and snack station and I was able to create a fun hot cocoa bar! I DIY’d the sign by layering the small “Hot Cocoa” sign on top of another wood framed sign I already had. I simply covered it with buffalo check paper first! The tartan plaid ice bucket is one of my favorite pieces, it adds so much to the space. Red wine glasses and fun Rae Dunn Christmas mugs were easy swap outs. I plopped a fun little tree into the Santa Mug (found at the Good Will) and propped up decorative paper plates tied with string and voila! Easy, big visual impact, and almost for free! If you’d like details on my kitchen renovation, just click here for all of that information! Let’s head in to the dining room next! The dining room space changed visually as well this summer with new wallpaper, a light fixture and that beautiful bench seating. I couldn’t wait to tackle this space with a more classic vibe. I created everything around the vision of this black, hand scripted paper scroll. I saw a beautiful tablescape by my friend Kristi (@thepickledrose on Instagram) so I messaged her to see where she found her scroll. To my delight she said she made it AND she would be happy to make one for me too! She is such a doll, and a talented one at that. From there I layered black and white striped wrapping paper underneath and then built the draping garland. To create the garland I started with a basic, pine garland with pine cones. I then added lots of layers of additional greenery, to give it a realistic look. I simply intertwined the stems with the garland and bent the wire to attach them all together. No extra wire, or glue was necessary! If you’d like more details of the process and what I used, please visit my Instagram page. Then click on my Highlight Stories button, “DIY Garland” as well as “Christmas 2018”. Once I finished the tablescape, I just knew my prints made by Katee (@PrintItEngineer on Instagram) would be the perfect addition to this Christmas dining room. You can also find Katee’s shop online here. On to the table setting! The only new thing I purchased were the black plates from Target’s Hearth and Hand line. I started with flat baskets (purchased from an online boutique years ago) to use a chargers and layered white plates (from Good Will) with buffalo check napkins (ordered from Amazon), topped with vintage gold flatware (also found at Good Will) and finished with a faux eucalyptus sprig. I placed a small black lantern (Hobby Lobby) with remote controlled tea lights (Amazon) at each setting next to the snowflake glasses (Dollar Tree 10+ years ago). I tied wreaths on the back of the chairs with black satin ribbon. I found the wreaths at Hobby Lobby! Our front room, aka the office, is always a fun whimsical spot to decorate because of the card catalog. I layered the pine trees in varying buckets and pots to create a small Christmas Tree Farm, just like the sign says! (from Smallwood Home) I picked up the large letter board on clearance from Home Goods. The street signs are from a local shop the NE Ohio, The Pine Tree Barn and the green metal truck is a vintage toy! The cute little mail envelope is from JoAnn Fabric and it’s the perfect spot to keep Christmas cards as they arrive or maybe place a letter written to Santa on the vintage typewriter. The tree(s) in this room are just as fun, especially sitting in the radio flyer wagon! These trees are so affordable from Walmart, 6’ and 4’ flocked. I added the lights, using some twinkle lights I found at the Dollar General. I cut up wrapping paper for the ribbon, used a children’s craft for the “dashing through the snow” ornaments, added lots of floral picks and then fun chalkboard “Elf Reports”, one for each kid! Think outside of the box when selecting wrapping paper. The stripe is traditional wrapping paper I bought on Amazon, the white plaid is my left over dining room wallpaper and the top, buffalo check is a roll of craft paper from the scrapbook section of Hobby Lobby! I realized after I shot all the pics, I didn’t get any of the garland on the staircase, except this one! So this will have to do! Be sure to check out my Instagram Story Highlights button to see the DIY video tutorial on how I put it all together! Before we had up those stairs to Christmas in the bedroom, lets take a quick peak at the living room! This was the newest spot for renovations as we finished the fireplace makeover and selected new furniture. See those details here! Sadly, our new gas fireplace insert was not finished in time for these pics, but you can catch it if you follow me on Instagram! I here I placed 2 trees directly in front of the large picture window. I used more leftover wallpaper cut into stripes as ribbon. I added floral picks and different size globe ornaments in black and white. The little green houses are actually made to cover a tea light candle and made for very affordable ornaments! I finished with a simple tree topper of ribbon in bows! In the background you can see I added small winter touches to the shelves like the antlers and Christmas greens! My stockings I found a couple years back at Hobby Lobby. They are simple white cable knit with a faux fur top. This year I added small hoop wreaths (At Home stores) and black satin ribbon (amazon) to make them feel dressier! They hang above that fun, wooden deer I got such a great deal on because his antler was broken. I was able to fix it with a little super glue and you’d never know! He also has a pretty hoop wreath! I found the fun bottle in the foreground from Big Lots and I love how the metal circle was in keeping with the hoops! The mammoth tray was a great find from Tuesday Mornings! I love how it allows the foot stools to act like a coffee table when we need it! The garland on my mantle was my favorite addition to the Christmas decor this year. I assembled it very similarly to the staircase garland I mentioned above. It makes it very affordable to have a full, realistic looking garland. Christmas came to the bedroom also! I switched out the black and white buffalo check for red and white and it’s the perfect festive touch. I found it on Amazon a couple years back. I love to mix and match patterns and textures and this fun rug from Hobby Lobby does just that. The wreath normally hangs over our bed, I just added the metal stocking! I have a pre-flocked 6’ tree from Walmart in here and to give it a little more “oomph” I set it inside my vintage laundry basket! I love that it added height and visual interest! I decorated it simple with red berries, unfinished wood ornaments, and a fun deer topper that I made a few years past! It’s fun to bring back decor and use it in new ways! It’s why I have such a hard time letting anything go!!! It’s also why my garage is still packed with decor, even after my home is fully decorated! 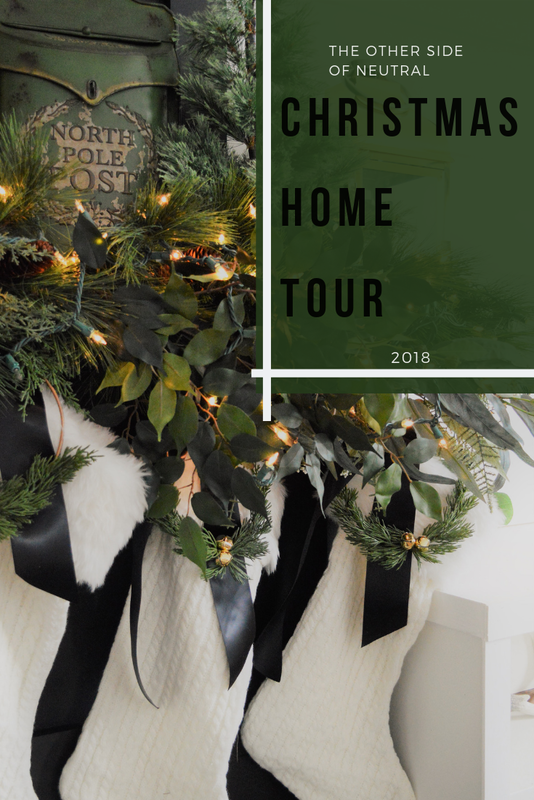 I hope you enjoyed taking a peek at my home decorated for Christmas! I hope you can follow me on Instagram for daily pics and that is also where I best answer questions about where to find the things I use in my home! Thanks for stopping by! Merry Christmas to you and remember, Jesus is the Reason for the Season!